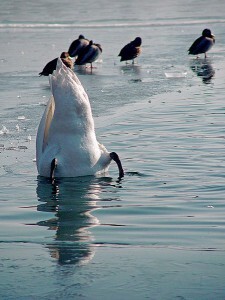 Figure 6.31: The swan’s long neck helps it to feed and turn its head with ease. Despite their amazing differences in shape, size and lifestyle, all birds have the same basic plan. However, different lifestyles have involved some distinctive variations on the central theme. Birds such as swans have more vertebrae in their necks than the short-necked parrots: swans have 25 vertebrae, parrots have 9. Necks are useful for getting your mouth to places you do not really want to take your whole body, like the bottom of a pond. They are also useful for turning your head, when your eyes are fixed deep in sockets, without having to turn your whole body. Most flightless birds, having no need of the large flight muscles, have therefore no need of the large keel or sternum that flying birds have. The exception to this rule is penguins who effectively fly through the water with their modified wings and still need large muscles to power them. It might not come as a surprise that birds have a lightweight skeleton. Most of the bones of flying birds are thin and hollow. Some have internal struts or trusses (cross walls) that make them very strong. (Some flightless birds, like penguins, have solid bones.) The keel-shaped sternum (breastbone) is where the powerful flight muscles attach to the body. Review the following images to begin exploring the similarities and differences between the skeletons of birds and other animals. Birds have a smaller total number of bones than mammals or reptiles. This is because many of their bones have fused together (like the middle to lower vertebrae), making the skeleton more rigid. 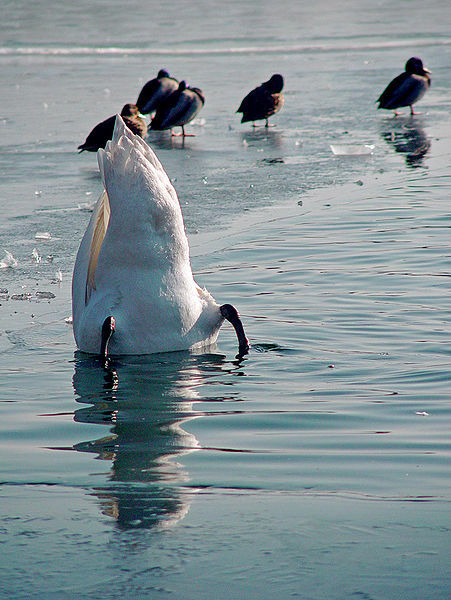 Birds also have more neck (cervical) vertebrae than many other animals; most have 13 to 25 of these very flexible neck vertebrae (this helps them groom their feathers as well as search for food in the bottom of ponds or streams). Birds are the only vertebrate animals to have a fused collarbone (the furcula or wishbone) or a keeled breastbone. 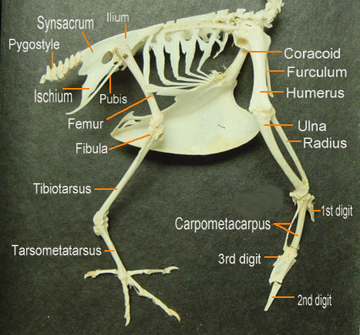 Figure 6.32: The keeled breastbone is at the center of the image of a bird skeleton. The next time you’re eating chicken or turkey and crack open a bone, pay special attention to its adaptations for flight. 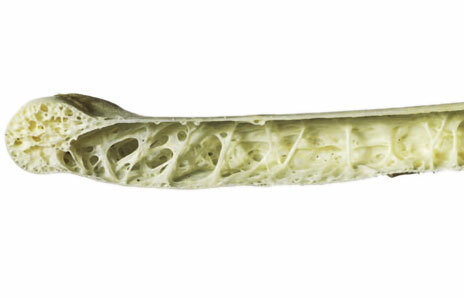 First of all, notice that relatively large bones such as those inside drumsticks are light and air-filled. Pork and beef bones in comparison are dense and solid. Some hollow bird bones are even equipped with cross walls which provide extra strength like internal struts in airplane wings. A bird’s horny bill is part of the skeleton, and even it, in view of the heavy-duty work it does, is amazingly thin and lightweight. It’s significant that bird bills contain no heavy teeth. Fossils of the earliest birds do have teeth, like the birds’ reptilian ancestors, so the lack of teeth is an adaptation reducing weight for flying. We’ll explore the beak in a little more detail later. As you continue to enjoy your chicken or turkey dinner be sure to admire the large breastbone. The white meat of chicken and turkey breasts is the birds’ powerful flight muscles, the ones responsible for pulling wings downward against air keeping the bird aloft. These strong muscles need solid anchoring, and that’s the breastbone. In wild birds, the more powerful the flier, the larger the breastbone; flightless birds such as penguins lack breastbones altogether. Figure 6.33: Cross section of bird bone. Have you ever wondered why white breast-meat is different from regular bird flesh? White breast-meat is composed of narrow, white muscle fibers that don’t burn free oxygen for their energy, as regular muscles do. The technical way of saying this is that metabolism in white muscle fibers is anaerobic (i.e. uses no oxygen) instead of aerobic (i.e. uses oxygen). Anaerobic breast muscles in ground-dwelling birds such as chickens and turkeys are desirable because during these birds’ brief spurts of flight to escape enemies (you never see these species soaring like songbirds), their circulatory system can’t supply oxygen fast enough to the flight muscles. White muscle fibers are good for brief, very intense work, but they tire quickly. While nibbling in the breast area, when you come to the curiously Y-shaped wishbone or furculum, notice how it’s positioned. The bone’s “handle” projects forward to prevent collapse of the chest during flight. In order to understand any animal it helps to know it from the inside out. Early naturalists tried to understand why birds could fly and humans (and other animals) could not. Naturalists and scientists have tried throughout the ages to determine what made bird and “non-bird” anatomy unique. 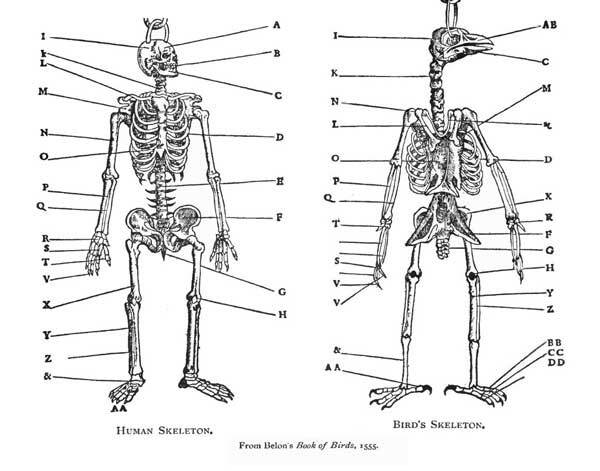 Pierre Belon noted several anatomical similarities between the human skeleton and that of a birds. Belon published La nature and diuersite des poissons in 1551. It contains many illustrations of his observations of fishes, marine mammals, and birds. His contributions led others to build upon comparative anatomy for various species, as well as explore more unknowns about the animal world. Figure 6.34: Pierre Belon’s sketches of human and bird skeletons from Portraits d’oyseaux, animaux, serpents, Herbs, arres, hommes et femmes d’Arabie and Egypte (1557).